1. The bottom ElectroBraid line starts 6″ above the ground. This line should be electrically grounded via a ground rod. 2. The second line should be spaced 7″ above the first line. This line should be electrically positive (+). 3. The third line should be spaced 8″ above the second line. This line should be electrically positive (+). 4. The fourth ElectroBraid line should be spaced 9″ above the third line. This line should be connected to the first line (via split bolt connector and copper hook-up wire) so that it is electrically grounded through the ground rod. 5. The top ElectroBraid line should be spaced 10″ above the fourth line. This line should be electrically positive (+). every 1300-2600 feet to ensure a safe, effective enclosure. 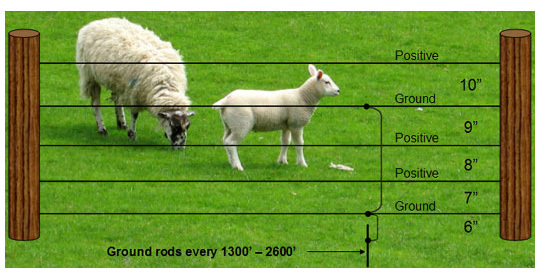 Configuring your ElectroBraid fence as shown above is an excellent way to keep your sheep contained and keep predators out. ElectroBraid is an easily installed, permanent electric fencing system designed to provide a safe and secure fence for your sheep and other livestock. It is strong, durable, reliable, and at a fraction of the cost of other electric fencing systems. Many sheep owners need a system for pasture management involving controlled grazing. ElectroBraid is the perfect temporary electric fence solution for this application. A temporary sheep fence can be installed very quickly at a very reasonable price.